There are a lot of mattresses customers have to choose from, including many that can be delivered right to their front door. If you’re on the hunt for the perfect mattress for yourself, it’s very likely that you’ve seen most companies and can’t decide which to go with. While there are many that are high quality, one brand that stands out among all others is Tuft & Needle. Chances are you’ve already heard of this brand, but if you haven’t, then this Tuft & Needle mattress review can help. Being one of the highest ranking mattress brands out there, it’s definitely worth learning more about. -What is Tuft & Needle? -What are the Consumer Reports? -How Long Will the Mattress Last? -Does it Offer Health Benefits? -Where Can I Find Discounts? One of the best things about this company is the fact that it wasn’t started as a venture to get rich. Instead, it was a company that was started out of necessity when both co-founders discovered a huge lack of transparency and fairness in the mattress industry. Both had spent thousands on top of the line mattresses, only to wake up with aches and pains that should have been avoided with their “quality” beds. To make matters worse, they weren’t able to return these, so they were stuck with investments that they genuinely didn’t want to use. Out of these experiences came Tuft & Needle, a new kind of mattress company. The co-founders, JT and Daehee, were originally software engineers until they discovered they wanted to shake up the mattress industry. In 2012 their passion drove them to develop a mattress that was not only affordable but also incredibly comfortable. This mattress included qualities that buyers wouldn’t find anywhere else, especially for an affordable price. These qualities begin with the fabric, which comes from a family-owned textile mill in the Carolinas. This textile mill has been in business for 90-years, making it a unique part of American history and one of the best mills in the country. The next incredible quality this mattress proudly boasts is American-made foam that’s both poured and cut right in the country. Last, but not least, Tuft & Needle mattresses were also sewn and finished in southern California. Before they were sent out, each mattress was compressed in order to arrive to customers in a cost-effective and easy-to-unload manner. The qualities that Needle & Tuft mattresses originally began with are still the same qualities that they have today. This is something you won’t find with other mattresses, as most manufacturers are always looking for ways to change and re-market their new models for an increased price. However, this company wanted to honor its customers and make something they could rely on to be comfortable for years to come. JT and Daehee wanted mattress buyers to use their Tuft & Needle mattress and stop worrying about finding another one. Thanks to their hard work, they’ve done just that. Tuft & Needle’s mattress begins with their own custom T&N Adaptive Foam, which you won’t find anywhere else. This is combined with a supportive layer that creates a comfortable and high quality foundation for the rest of the mattress. The mattress is then covered with a plush cover that’s breathable to prevent sweating and help keep you cool at night. Although there aren’t a lot of parts in the design, that’s for good reason. This company has chosen to focus on quality, so each of the materials are durable, comfortable, and can help you get a good night of sleep without the extra bulk. According to over 100,000 Tuft & Needle mattress review, these beds are very comfortable! In fact, this brand has some of the best reviews out of all mattress companies, which is pretty impressive. Even their online reviews are excellent, which is only more motivation to buy one of these. There are also quite a few blogs that showcase this mattress and boast about how comfortable it is right from the start. While there are a few other mattress companies that have good reviews as well, it’s safe to say this company has them beat. This is especially impressive given the fact that Tuft & Needle hasn’t been around that long. If you’ve been disappointed by mattresses that are too soft, too firm, or that cause aches and pains when you get up in the morning, this may be the type of support you’re looking for. Because it adapts to each body individually and has only a couple layers of quality foam, it’s not going to put too much pressure on your back and body. This is one of the best parts about these mattresses and a good reason to try it out. What are the Consumer Reports? Tuft & Needle took the #3 spot on the Consumer Reports ratings of memory foam mattresses. This is pretty impressive given the fact that there are many other memory foam mattresses out there at the moment. In fact, some of the biggest names in mattresses scored dead last, while new companies like T&N scored incredibly high. Consumer Reports also noted that it’s comfortable for all types of sleepers and has the features that most people want in a mattress. Although this resource shouldn’t be the only factor going into your decision, it is a reliable place to find honest information about brands. Given the fact Tuft & Needle has good reviews, it’s safe to say it’s worth the investment. When most people buy a mattress, they want it to last for at least 10 years because they are spending such a large sum of money on it. Tuft & Needle took this into consideration and used materials that would last a full 10 years. In fact, this mattress even comes with a 10-year warranty from the company, which is unheard of for the top brands out there. When you buy this, you’re spending your money on something that you’re extremely unlikely to have to return. This can give you peace of mind and confidence that this will be your mattress for at least the next 10 years. T&N believes that what’s inside of your mattress matters, which is why they use organic materials. This means there is nothing synthetic within the mattress and it hasn’t been treated with chemicals that could put your health at risk. Additionally, Tuft & Needle comply with organic standards that other companies may not even look at when they create their design. Although you’re not eating your mattress like you would organic fruits and vegetables, this label is still important. You lay on your mattress for a long time, and if it were to be made with chemicals, these would come in contact with your body for years. If you’re looking for a safer way to sleep, this is is. Another health benefit of these mattresses is the fact that they can help alleviate aches and pains that other mattresses cause. However, this is never guaranteed. But for those that do experience improved pain, they are able to get through the day with more energy and less discomfort. Since this company does offer a 100-day trial, it’s worth trying out to see if it might be able to help with any aches or pains you experience when waking up in the morning. Yes! As mentioned earlier in this Tuft & Needle mattress review, this company offers a 10-year warranty for those who purchase their mattresses. This limited warranty applies to defects in the materials resulting from “defective materials or workmanship”. This includes indentations, flaws in the foam, or manufacturing defects in the cover. If you purchase one of these mattresses and you are confused about what’s covered, you can simply give them a call. Most buyers have found it’s incredibly easy to get a hold of customer service and find the answers they’re looking for in regards to the warranty. Throughout the year, Tuft & Needle does have coupon codes that can help you save money on your mattress purchase. However, these aren’t guaranteed to always be available. You may also be able to find good deals during the holidays or when trusted retailers have sales. Fortunately, this mattress on its own isn’t as expensive as similar mattresses. This means you don’t have to wait around for a coupon code because it’s already affordable. However, if you’re looking for a discount, you can easily search around online to see if you can find the best price. You can easily buy Tuft & Needle mattresses right on their website, which is where they have most of the information you’ll want to know about the brand. However, this does require adding your personal information and credit card. If you’re looking for an easier way to do things, just go on Amazon!They are one of the retailers for this brand, so you can feel confident going through Amazon for your purchase. The best part is that you likely already have an account with Amazon, so you won’t have to type in your address or credit card information. Instead, you can just add the size of mattress you want to your card and then click “purchase”. This makes it easy to set yourself up with this mattress and try it for yourself. If you decide you don’t like the Tuft & Needle mattress, you can return it for a refund. However, this must be within your 100-night trial, otherwise you are not able to make the return. Fortunately, this company doesn’t waste the mattress. They will donate it for you or you can choose to donate it for yourself (although you most show proof of donation to choose this option). It’s important to note that if you purchase this mattress from Amazon, the return policies may be different. If you’re worried about whether or not you’ll be able to return, you might want to chat with Amazon customer service ahead of time. If you want an exchange instead of a return, you also must be within the 100-night sleep trial timeline. If you are, then you can call the company and they can take care of the exchange process for you. They’re incredibly helpful and are dedicated to making sure their customers end up with the mattress that’s right for them. There are many pros when it comes to Tuft & Needle mattresses, but there are cons as well. If you’re heavily considering purchasing one of these, then it’s important to weigh these in order to make your decision. To help, some of the pros and cons are listed below. Read through each to determine if they are benefits or setbacks for you, in particular. – 100-night sleep trial allows you to get a good idea of whether or not you like this mattress. If you don’t end up liking you, you can return or exchange. With other mattress companies, this is not an option. – The company has great reviews online, even for being fairly young. If you base the majority of your purchases on how other people did with them, then this will not disappoint you. It’s hard to find another mattress that has the star rating that this one does. – The mattress is made with high quality materials and is comfortable. When it comes to a mattress, this is pretty much as good as it gets. – You can buy through Amazon, which makes it a lot easier to get the purchase completed in just a few minutes. – This mattress comes to you in the mail already compressed, so it’s very easy to take out of the package and place in your bedroom before opening. – Once the 100-night sleep trial is over, you will not be able to return the mattress. – Some reviewers state that this mattress is on the firmer side. If you prefer a really soft and cozy mattress, this may not be the right choice for you. – You’ll need a box spring or platform bed to place this on. 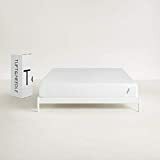 If you take anything away from this Tuft & Needle mattress review, it’s that this is a great mattress worth considering. It’s affordable, easy to find, and is made with quality materials. If you do end up making it your choice, don’t forget to write a review so you can help other shoppers as well.